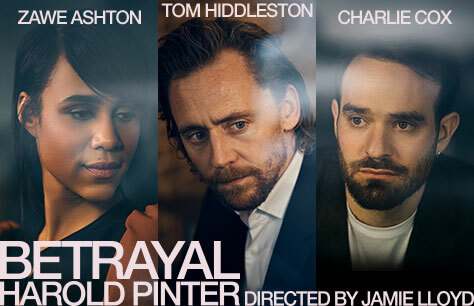 Golden Globe and Olivier Award winner Tom Hiddleston stars in the Jamie Lloyd Company’s revival of Harold Pinter’s Betrayal, opening at London’s Harold Pinter Theatre for a strictly limited 12 week season from 5 March 2019. With poetic precision, rich humour and an extraordinary emotional force, Betrayal charts a compelling seven-year romance, thrillingly captured in reverse chronological order. Described as “the greatest, and the most moving, of all Pinter’s plays” (Daily Telegraph), this production marks the culmination of the Jamie Lloyd Company’s ground-breaking Pinter at the Pinter season. Please note tickets will be posted out two weeks before the show date. A stunning play. Theatre was beautiful. Staff very helpful. A lovely evening. Theatre staff were amazing, the play was brilliant. We had 'standing' tickets which were excellent value and a great view.